The Monday Bunch and other local knitters are participating in a fund-raising auction to save a community center, creating a growing pile of stuffed animals and toys right in front of the auctioneers as the audience bids. Among those contributing the most knitted goods is temperamental businesswoman Maddy Hanover—who keels over halfway through the event. After she is pronounced DOA, an autopsy reveals that Maddy had been poisoned. But how? And by whom? One of the prime suspects is her ruthless business rival Joe Mickels, who lost a bitterly contested property bid to Maddy. 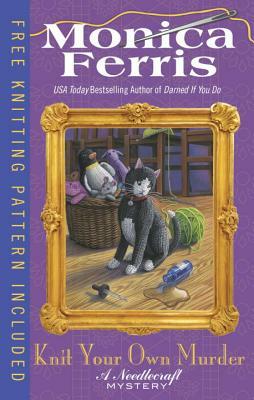 Monica Ferris is the USA Today bestselling author of the Needlecraft Mysteries as well as several mystery series under various pseudonyms. She lives in Minnesota.